The Twin Stone Pagodas are located on both sides of the terrace in front of the Grand Hall. They were set up during the restoration of Lingyin Temple led by Qian Hongchu in 960, the first year of the Northern Song Dynasty governed by Emperor Jianlong. At that time, four stone pagodas were built up, but now only two remain. These two pagodas are among the most ancient stone pagodas dating back to the Northern Song Dynasty. The Twin Stone Pagodas are 42 meters apart, and both are wood-like solid stone pagodas in the shape of octagon. They are constructed into a 12-meter high multi-layer structure, with a total of night layers, reducing in size from the bottom to the top. Each layer is carved with the pattern of “Hu Men” (a kind of Buddhist images) in smooth lines on four sides (east, south, west and north). There are porches, columns, canopies, and all sorts of brackets built inside each layer as well. The eaves and semicircle-shaped tiles carved on the pent roof are all modeled after the style of multi-layered wooden pagodas. Currently the Tasha parts (the top of a Buddhist pagoda) of the two pagodas have already been destroyed. Therefore, both of the remaining pagodas are only 11.49 meters high. 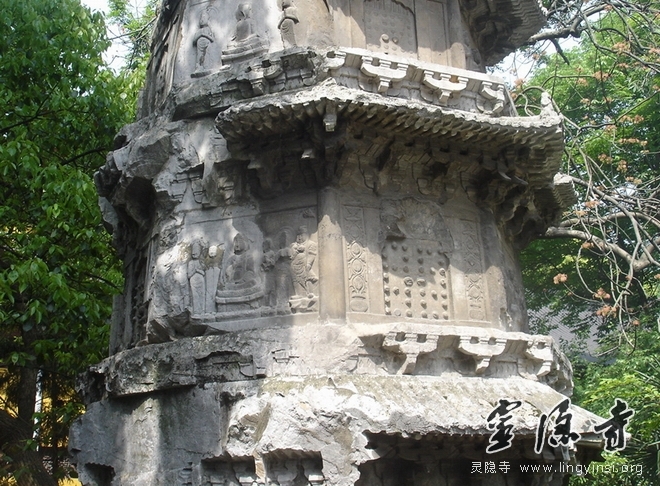 The body part of each pagoda has night layers, engraved with “Hu Men” patterns on four sides. Inside the pagoda, there is a closed solid door with two side rooms on its sides and walls on the other four sides. Both of the side rooms and walls are carved with Buddhist sutras in regular script and all kinds of Buddhist images such as Bodhisattvas, monks, immortals and so on. The upper eaves of the pagoda are embellished with carvings of semicircle-shaped tiles, flat tiles, hipped roofs, rafters, flying rafters, drip tiles and eave tiles. The pagoda rests on a Sumeru throne, which is carved with the Usnisa Vijaya Dharani Sutra in regular style, legibly for visitors. 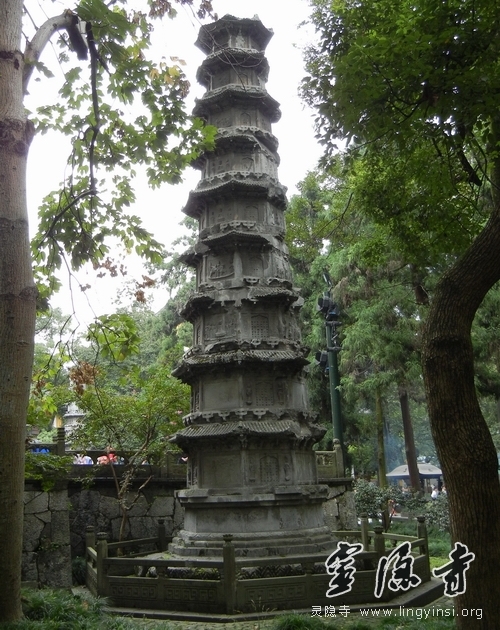 The pedestal under Sumeru throne is carved with the pattern of “Night Seas and Eight Mountains” which is prevailing among pagodas in Wu-Yue area of the ive Dynasties. On two sides of both East and West Pagodas are embellished, respectively, with Smantabhadra Bodhisattva and Manjushri Bodhisattva. On the west side of east pagoda, under the eaves of the third floor, a stone tablet is inscribed with the name of the pagoda, while the other tablet of the west pagoda not longer exists. Since these two pagodas have been in existence for over 1000 years, almost every part of them has problems of dilapidation, disintegration and weathering in various degrees.